Home / booze / events / hotels / Mothers Day brunch half price for mothers! Mothers Day brunch half price for mothers! Coming up this Sunday 14th is Mothers Day - The second Sunday of May is observed as Mothers Day by more countries in the world than any other day (including Australia, Bangladesh, Canada, Germany, India, Malaysia, Dutchie land, NZ, Pakistan, Philippines, South Africa, Sri Lanka and the USA). 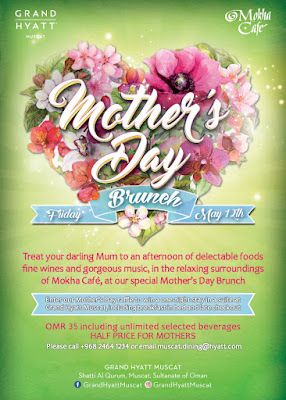 As Mothers day in Oman is celebrated on the 21st of March (and the Brits this year did it on the 26th of March) there are not very many events in town this weekend to celebrate the very real achievement of being a mum. 1. If you are a Mum, the brunch is half price. That's RO 17.5 for brunch including unlimited selected beverages. 2. Ramadan is coming, so why not get your brunch on before you cant? !